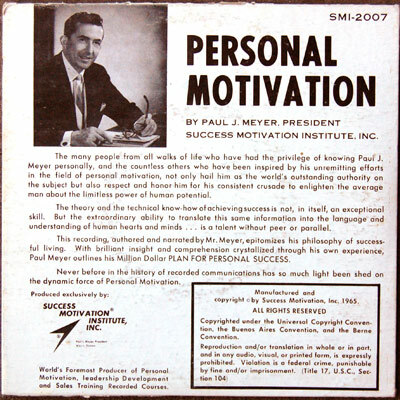 I picked up this Personal Motivation 7″ about 15 years ago, thinking that I might someday do something with it. Recently, I have been figuring out how to play the guitar, and decided to put it to use. Well, here is rough draft of a song that I am recording. Guitars by me, drums by Garageband, vocals by Paul J. Meyer. Enjoy! This entry was posted on Monday, August 24th, 2009 at 9:12 pm	and is filed under Guitar, music. You can follow any responses to this entry through the RSS 2.0 feed. Both comments and pings are currently closed.